Bell Let's Talk National Spokesperson Clara Hughes visiting YWCA Toronto's Winona's Place, an affordable housing initiative for indigenous women, last year. Some of the most passionate mental health advocates work in women's shelters. Women on the front-lines for addressing mental health needs. Women supporting other women to find safety, stability, and empowerment in their lives -- in a way, sisterhood embodied. We need to hear their voices as Canada embarks on necessary (and overdue) conversations on the state of mental health care. There is no one-size-fits-all approach. Mental health stigma is real and online campaigns like Bell Let's Talk are helping to dismantle it by sparking conversations. This is positive -- but we still have a ways to go. Some mental health conditions remain misunderstood, like schizophrenia and bipolar disorder. We must talk more about the prevalence of violence against women in our society and its inextricable links to trauma and mental health. We also need to educate ourselves on how to recognize and respond to trauma-induced coping mechanisms, like addictions. No one should suffer in silence for fear of stigma. Research shows that access to mental health care and support is deeply gendered. Women are three times more likely than men to experience barriers accessing health care services and, most mental health research and therapy is based on a male experience. Both are health gaps, according to a Women's College Hospital campaign. These heath gaps increase even more for women from low-income, marginalized and disadvantaged communities, who tend to have more health-related issues as a result. This is unacceptable and preventable. It should be a priority for all levels of government to close these gaps. This research matches what we hear from the women with whom we work. Regularly, women tell us that they are unable to access the trauma-informed counselling that they need -- it is too expensive, wait lists are long and some counsellors are inadequately trained. Many programs are short-term or not available at all, such as addiction detox beds. And the types of alternative support that survivors find most helpful -- like art-based therapy -- are often not funded. Addressing these pressing concerns is all part of the unfinished business of public medicare. Equally important, are reforms to ensure that our health care system recognizes and responds to intergenerational trauma from residential schools when treating indigenous clients. The tragic suicide crisis claiming the lives of indigenous children on reserves underscores the urgent need for investment in indigenous-led traditional healing programs that empower indigenous peoples, especially women and girls, to reclaim their identity and culture. There is a need for more social services, too, that are culturally-appropriate, as YWCA Toronto has done with Winona's Place -- our affordable housing initiative for indigenous women visited by Bell Let's Talk National Spokesperson Clara Hughes last year. "Trying to recover and deal with the psychological and physical impact of violence is even more stressful when you are forced to worry about bills, keeping your family housed and becoming employment ready before your recovery is fully complete. It should not be this way." These strong words reflect the experiences of many women in shelters. Given this context, it is not surprising that an annual survey of women's shelters identified the increasing complexity of women's needs and stagnant funding as top challenges facing the sector. The resilient women with whom we work are navigating multiple systems that can seem stacked against them. 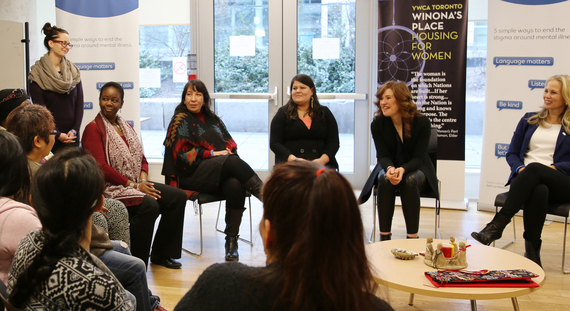 The range of specialized support staff that we employ in YWCA Toronto shelters highlights these complexities clearly -- we have mental health workers, children and youth workers, transitional housing workers, immigration and legal workers, harm reduction workers and overnight trauma counsellors. Every day, we see women taking back control over their lives -- it is meaningful work, but there must be new funding models that reflect these new realities. In shelters you come across workers who have a strong desire to advocate and push change forward. Together, we are strong advocates for an end to violence against women, and for upstream investments that close health gaps, build our social safety net and improve women's health and well-being in concrete ways. There is a great amount of hope in our work. Nina Gorka is the Director of Shelters and Girls and Family Programs at YWCA Toronto and Etana Cain is the Senior Advocacy and Communications Officer at YWCA Toronto.